Stir gelatin into cold water and let stand 1 minute. Combine whipping cream, sugar and soaked gelatin in saucepan; cook and stir over medium heat until gelatin dissolves, about 5 minutes. Transfer to bowl and cool 15 minutes. Whisk in yogurt, sour cream and vanilla. Divide mixture among 6 to 8 stemmed glasses; refrigerate until firm, about 3 hours. 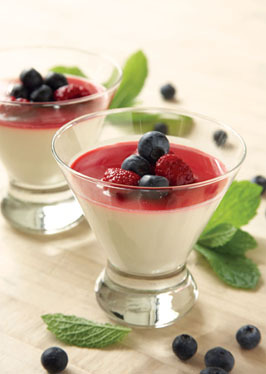 To serve, top each dessert with 1 oz. raspberries and 2 tablespoons fresh blueberries. Garnish with mint sprig.